As you may have gathered from the article on Salem Sue (world's largest Holstein cow), North Dakota truly is the land of the giants. This becomes apparent in Jamestown, North Dakota, a mere 90 miles west of Fargo (oh, jeez!) when you catch a glimpse of the world's largest buffalo from Interstate 94. 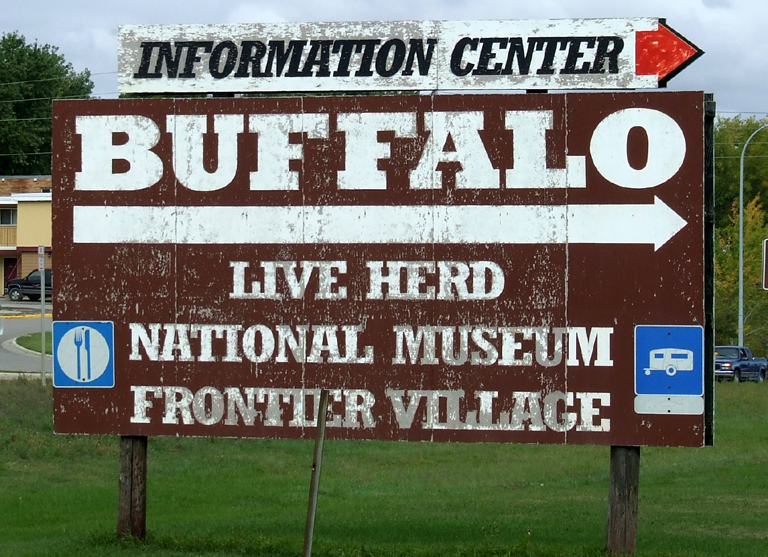 You could be content to pull off to the shoulder, exclaim, "That IS a big buffalo" and head back on your merry way to see the world's largest sandhill crane, but why not stop and see what makes Frontier Village interesting? Fight the urge to turn around at the gates, even though it looks like you're about to enter Walt Disney's version of F Troop. Ignore the wind vane decorated to look like a Native American headdress and pull all the way down the road to the parking area. From the parking lot you will have no problem finding the world's largest buffalo - nothing stands between you and the behemoth except a dirt path. Normally by this point in the article I would have been using the beast's name (e.g., Betsey the lobster, Sandy the crane, Salem Sue the Holstein, etc. 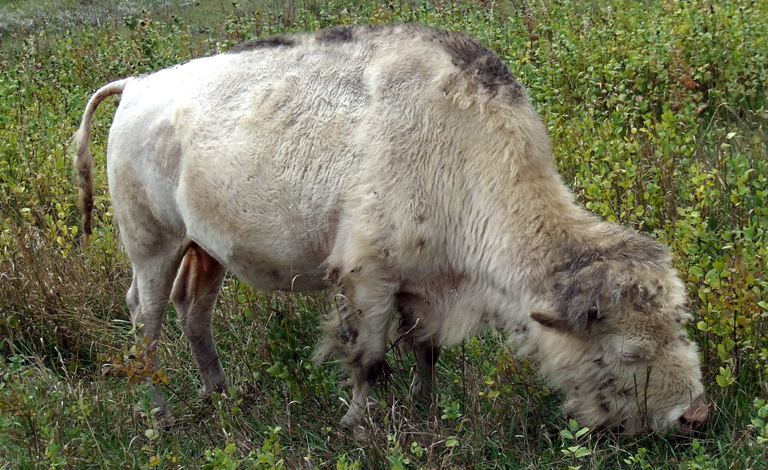 ), but for some unknown reason he (yes, the buffalo is anatomically correct) doesn't have one. For the sake of this article we'll call him "Bill". As you approach "Bill", the magnitude of his size becomes apparent. 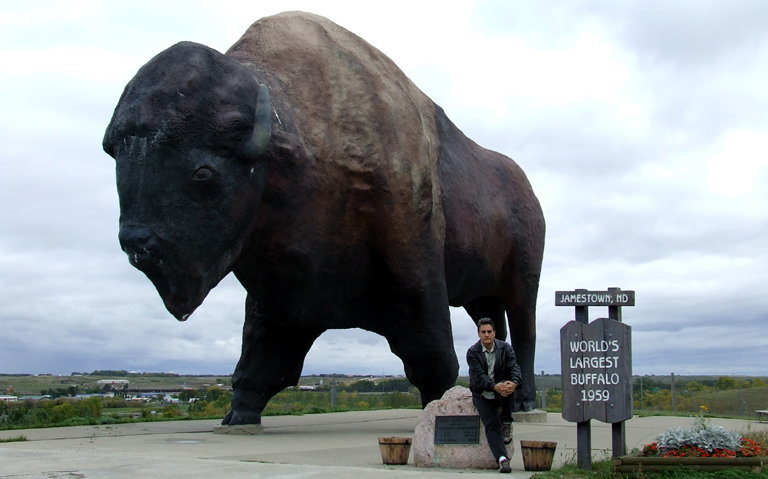 Although shorter than Salem Sue (at 26 feet high by 46 feet long), the buffalo outweighs her since he was made from the best giant beast material available in 1959 - reinforced concrete. At 60 tons, no one is going to be backing their Ford F150 up to steal the sculpture any time soon. Because of the degradation of the materials, "Bill" needs occasional grooming - on my visit he appeared to be sporting a recent coat of paint. The sculpture was created by artist Elmer Paul Peterson at a cost somewhere between $4,500 and $8,500 and dedicated by Nelson Rockefeller. The sculpture actually preceded Frontier Village, which was built with the existing statue as its centerpiece. Walking back up from the statue and past the parking lot takes you into "the village", a collection of old and historic buildings moved there from elsewhere and assembled on both sides of the drive. Some of these are open to the public during the height of the summer tourist season, having been converted into mini-museums or shops, but personally I'll take elbow room over living dioramas any day of the week. This entry was posted in Trippy Trips (On the road and overseas, things to see along the way), USA and tagged buffalo, Frontier Village, Jamestown, ND, North Dakota, white, worlds largest. Bookmark the permalink.